I believe and actively practice, day in day out, these four timeless principles, that are to me, the four main pillars of our industry. They will stand the test of time - no matter how technological, connected and automated hospitality becomes. Actually, in this social media era where everyone acts as a publisher, there is additional marketing value to being remarkable. I believe this to be the key of hospitality. Our business just naturally attracts a high percentage of people with a sense of urgency about them – there is just too much to be done! The truth is that guests staying in your hotel are counting on you and you should never disappoint them. A sense of urgency is an unrelenting push for results, or identifying matters of pressing importance and acting upon them immediately. You must avoid resting on the laurels of success. Everything in hospitality is designed to meet the discerning needs of our guests. Ultimately, it is what defines our operating standards – check out times, turn-down service, dining reservations and minutes to delivery quoted by room service, are all designed to meet guests’ satisfaction. When practiced with a sense of urgency, our intention is to exceed guests’ expectations. In hospitality, a “sense of urgency” is a good thing. Yet many hoteliers confuse this with a “sense of emergency”, which insidiously saps the life from their operations. I love the motto: Offer no excuses and accept no excuses. It tells you a lot about someone who makes excuses and tells you a lot about someone who refuses to. When we host a guest at our establishment, implicitly we make a promise. Delivering this promise should be done consistently at all times. There are no shortcuts in quality and we all learn from our mistakes. One often hears excuses from managers when they have a bad result from an inspection. The chef or the restaurant manager was off, the head housekeeper was on holiday, and so on. There are often legitimate reasons why these mistakes happen. You can explain to customers why things went bad, but what guests really want is the mistake quickly fixed on the spot, long before their stay is ruined. So forget the excuses, and have a plan in place to fix the problem – and I mean any problem that may arise. Speed and efficiency during a crisis saves the day. Most guests will deal well with a problem if they know you’re doing your best to fix it. What they don’t want to hear are excuses. True hoteliers know that small details exemplify their service and make guests’ stays more comfortable. There’s a delicate balance between proactive and presumptive service. The guest should feel in command and not dictated to. Hoteliers should think things through, have a sense of priority and attention to detail, be practical and follow-through. Hoteliers should ask questions, give options, and the let the guest decide. No matter how elaborate your turn-down service is or how packed with technology your hotel rooms are, it’s the staff that really make the difference. Engaged staff are intuitive to guests’ needs and go out their way to help. They surprise the guest with their knowledge of their likes and dislikes (“Would you like a glass of the white wine you had last night, Mr Brown?”), open doors, and deliver service with an unwavering smile, no matter how tired, fed up, or busy they may be. As well as focusing on the guest, hoteliers should trust, nurture and recognize the ability of every staff member. Empowering them and instilling a pride of ownership will make them go beyond their job tasks and adapt and modify their services to meet guest’s needs. They will add those little touches that go beyond the usual, taking pride in their craft and giving that crucial, ultimate edge in the competitive hospitality business. The bottom line: SNAP is simply the way to create a memorable experience and make a guest know great service when they do find it. It feels brilliant and rare, but at the same time completely natural. It is an experience guests will want to repeat and tell their friends, colleagues and online reviews about – the way things should be. 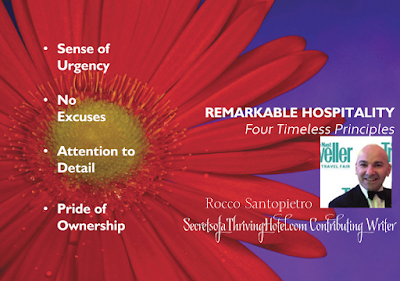 Rocco Santopietro is a mentor and coach who focuses on building new business, securing guest loyalty and forging strong relationships. Rocco has many years operational experience in five-star properties and a strong track record of providing excellent customer services improving quality scores and overall performance.